Let me be clear, the Russian International Affairs Council (RIAC) is not fair, objective, or unbiased in any shape, way or fashion. RIAC spews propaganda, more gently than trolls, but they seek to promote Russian national interests first, assist in sowing division in the West, and undermine Western governments. Russia is the victim, the West is the aggressor. The West is provoking incidents with Russia in order to place more restrictions and sanctions on Russia to reduce its economic power and further the West’s hegemony. Please note, nowhere in the article do they deny spewing propaganda, but they are pushing for a mutual agreement to reduce the ‘information war’. Pshaw. This is an acknowledgment that Russia considers itself in an information war with the West. ‘Facilitate Russia’s peaceful integration into…’ is a euphemism for ‘we will promote Russian national interests through whatever means are necessary’. 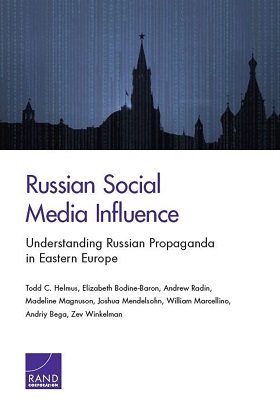 In this case, by examining the RAND report “Russian Social Media Influence”. It undermines the credibility of the report and seeks to diminish its effectiveness. Their first attempt is to say that Russian propaganda is not defined. The last point they attempt to make is not at all true. President Trump, while at the summit in Finland, raised this issue with President Putin, who said ‘Russia will not interfere in the US election’. We can see from Hamilton 68 and a lot of other reports, that this is not the case. As a matter of fact, various seniors in the US have directly admonished Russia to stop their information war with the West. Here the US Embassy is asking for just that. RIAC will do whatever it takes to muddy the waters and continue pointing out that Russia is under an information attack from the West, they are the victim. RIAC will point out that the Ecumenical Patriarch in Constantinople is attacking the Russian Orthodox Church, stripping them of a centuries-old tradition. RIAC will point out that the two GRU agents identified in the Skripal attack are, by Putin’s own words, civilians. What will it take for Russia and the RIAC to stop? A Russian perceived victory, anything short and Russia will not be satisfied. “Russia is engaged in an active, worldwide propaganda campaign,” reads the fairly straightforward beginning of RAND Corporation’s report on Russia’s influence on East European countries via social media. The document, compiled by eight authors with support from the Office of the U.S. Secretary of Defense, looks into the nature and effectiveness of this influence and aims to identify possible countermeasures to it. The report is the latest in a series of publications by the research centre, which has close ties to the Pentagon, on how to counteract Russia. In particular, it complements the widely cited 2006 report “Reinforcing Deterrence on NATO’s Eastern Flank,” which talked about the threat that Russia allegedly posed to the Baltic States and possible ways to deter it by conventional means. The new report extrapolates this logic to the digital space. Titled “Russian Social Media Influence,” it is a continuation of the collection of U.S. projects on Russia’s informational impact, which, in the light of the scandal concerning “Russian interference” in the 2016 presidential election, has turned into a new “major threat” for political circles in Washington. RIAC… never has there been a more wretched hive of scum and villainy. My thoughts exactly. One big difference, however. We interacted with the RIAC group on LinkedIn, not the RIAC itself. Guess which sleazy Pigsty Pinup Queen commented? Did you hide the nasty comment from the equally nasty, and sad filer of lawsuits that don’t even gain a mention in their own country’s court? Sad? I suspect that they’re nostalgic. Nah, it wasn’t worth the electrons. I deleted her sad blathering. She’s still a Pigsty Pinup Queen, no better. I heard she’s fighting to keep her job. Ever since I put her fame in a Pigsty, pigs hate me. She’s a disgrace to pigs.